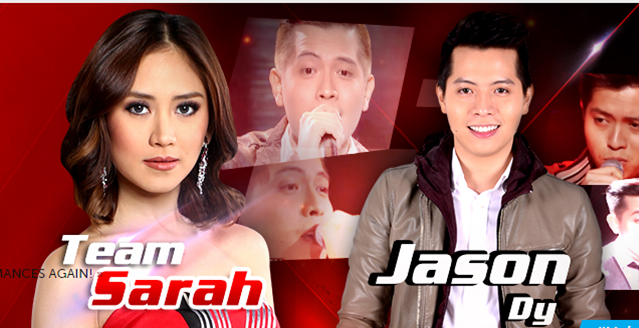 MANILA, Philippines - Haranista Jason Dy sang Miley Cyrus' hit song "Wrecking Ball" on the Final Showdown of ABS-CBN's leading vocal competition 'The Voice of the Philippines' on Saturday, February 28, 2015 at the Newport Performing Arts, Theater, Resorts World Manila, Newport City, Pasay City. The 23-year old singer from Butuan City performed a duet song with International Singing Sensation Charice. He joins The Voice of the Philippines to honor his mom who had been supportive of him and his passion. Aside from Jason, other artists fighting for the grand title are Team Apl’s Alisah Bonaobra, Team Bamboo’s Rence Rapanot, and Team Lea’s Leah Patricio. The second winner of 'The Voice of the Philippines' will be named based from the outcome of the public's votes. The winner will receive a trophy designed and crafted by contemporary artist Leeroy New, a house and lot worth P2 million, a music instrument package worth P100,000, shopping spree and Asian tour package worth P350,000, a business package worth P1 million, a new car worth P1 million, a recording and management contract with MCA Music, and P2 million in cash. Text VOICE JASOND and send to 2331 for ABS-CBN Mobile, Globe, TM and Sun Cellular subscribers and 231 for Smart and Talk 'N Text subscribers. The tariff is P1.00/vote for ABS-CBN Mobile, P2.50/vote for Globe, TM, Smart and Talk 'N text and P2.00/vote for Sun Cellular subscribers. Note: One vote per artist per SIM per round only. Just like in the previous season, the finale was aired in a two part episode (Saturday and Sunday). On Saturday, the four coaches and the top 4 artists opened the show. Lea Salonga and apl.de.ap first sang Christina Aguilara's "Feel This Moment," it was followed by Bamboo Mañalac and Sarah Geronimo who sang Ed Sheeran's "Sing". All the coaches and the top 4 artists then performed "Feel This Moment." Partial percentage of votes was revealed on Saturday after the duet song round, Artist T leads with 44.78% followed by Artist V with 18.98. Artist O and P got 18.54% and 17.69% of votes respectively. The finale episode on Saturday tops online conversations with '#VoicePH2Finale' among the trending topics.